Trees add beauty, interest and much needed shade to your yard. Replacing trees is a big investment, which is why properly pruning and maintaining them is essential. Not sure what kind of trees you have? An arborist is professionally trained in identifying the species and determining the health of individual trees, in the name of safety -for the trees and for your family. They can diagnose diseases, insect problems and soil health. Consult an arborist to find out what trees are best for your landscape and where to plant them. Many are certified by the International Society of Arboriculture. Prune your trees during their dormant season (late fall, early winter) to minimize sap loss and stress to the tree. This will reduce the risk of fungus infection and insect infestation. Know what kind of trees you have – some flowering trees like to issue buds on old growth in the winter and then bloom in early spring. If you prune one of these trees in the winter, you may not have any blossoms come spring. Avoid pruning a newly planted tree – give it time to establish. Prune when the leaves have fallen – it makes it easier to see what needs to be cut. Never cut more than 25% off of your tree at one time. Don’t trim branches near electrical lines – call a professional or the power company. Never cut the top off a tree – this can cause the tree to die. Thin branches out instead. If it is too tall, consider removing the tree completely. 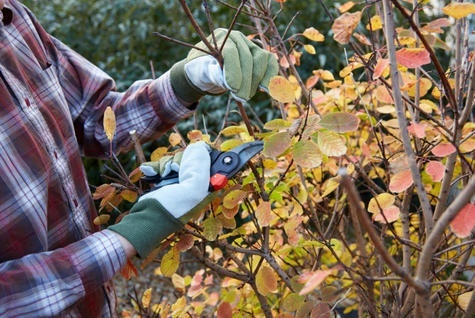 Always use clean, sharp tools for pruning; you wouldn’t want anyone cutting on you with a dull blade, right? When removing diseased branches, wipe your cutters with disinfecting wipes between each cut. This will keep disease from spreading as you cut other branches. You can also use a solution of 1-part bleach to 9-parts water and dip the cutters in as you work. Anvil hand pruners – for small branches up to a ½-inch in diameter. Long-handled loppers – for medium sized branches up to 2.5 inches in diameter. Pruning saw – for larger branches, use a pole extender to reach the higher branches. If you would like a detailed how-to on pruning techniques, read our blog, Getting Ready for Fall Part 1: Tree Trimming a Seasonal Sport or visit the Arbor Day Foundation’s webpage for more information. There are times when every DIY’er needs to step back and let a professional take over. If the limbs you want to cut down require the use of a chain saw and a ladder, then maybe this is one of those times. There’s no shame in playing it safe! Trees are the crowning glory of any yard, so take care of them. At the end of a long day of pruning, sit down in the shade of your trees, relax and remember the words of John Muir (father of our National Parks): Allow nature’s peace to flow into you as sunshine flows into trees. Congratulations! Another job well done. Now, go hug a tree! From tree pruners and chain saws to wood chippers and wheelbarrows our expert staff is always on hand to help with your next DIY gardening project. As always, if you have any questions about pricing or how-to’s, don’t hesitate to contact us. Stop by our store — we’re open seven days a week.